Here will I hold. If there's a power above us (And that there is, all nature cries aloud Thro' all her works), He must delight in virtue; And that which he delights in must be happy. Benjamin Franklin was 20 years old when he wrote the above words at the top of his newly defined system of self improvement. He was returning from an 18 month letterpress apprenticeship in London which was an 80 day voyage and, I suspect, leaves one much time to reflect. Otherwise you'd go stir crazy. I have been endeavoring to do similar as I entered my 30s. I intended, and still do intend, for this decade to by one of introspection. I desire a closer relationship with my inner self and deeply desire a better understanding of my own motivations and movements in the world. Unsurprisingly, I became enamored with Franklin’s 13 virtues while reading his autobiography; and, as I have been struggling (seemingly in perpetuity) with my own tenacity at self-understanding, believe having something more systematic will be useful. Thus: I'm going living by Franklin’s virtues. I am, however, not striving for moral perfection. I don’t know if I even fathom what that would look like given my beliefs and place in the world. But it is no matter. The process of watching myself, having a focus, should help reveal it. 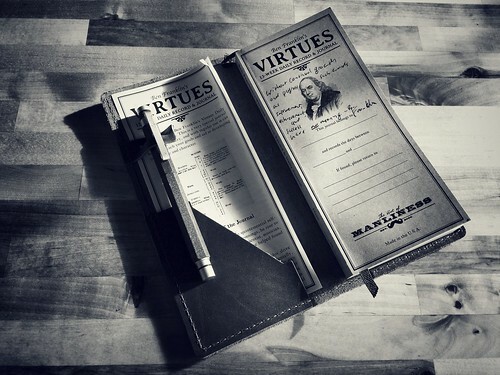 Alyska gifted me the Art of Manliness incarnation of Franklin’s journal. It’s what is pictured above and I’m going to use it. 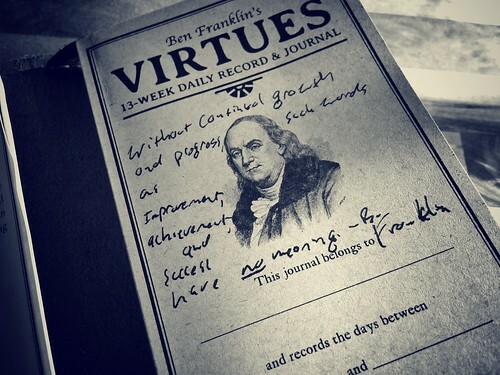 Franklin’s virtues are laid out in 13 week intervals with the focus of each week on one virtue. Each week has a 7x13 grid - 7 days to a week, 13 virtues to track. Though the intention is to live by the definitions of each, you take especial care to acquire the habits of one particular virtue. At the end of each day, you tally your adherence to each virtue by placing a dot in the square for each virtue you did not succeed at, kind of the opposite of the Seinfeld Calendar4. 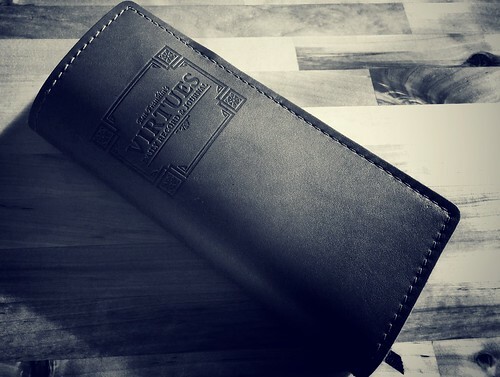 Over the course of the weeks, you should see a decrease in the dots for each virtue. And only then shall your power be over 9000. My intention is to start each week defining what the 13 virtues mean to me. I’m not so silly to think Franklin’s definitions will transplant perfect to a modern life nor to my place in it so want to find my own meaning for each. At the end of each week, I’ll reflect on what I learn. As I’m a new age kind of guy6 I’m be posting about it here along with additional explorations into virtue, morality, and ethics. Hopefully I’ll learn something about myself. At worst, this will be a lovely way to extend my morning protocol journaling.